Many adults fail to see the devastating effects that bullying can have on kids, instead viewing the teasing of bullies to be simply a normal childhood experience. Being the victim of a bully, though, can be highly distressing for children and teenagers, who can suffer enormously from the abuse, harassment, and sometimes violent nature of bullying at the hands of their peers. Most of us can recall a certain level of good natured teasing from when we were kids, but outright bullying is anything but good natured. Bullies have a tendency to wage full-out campaigns against other children and these verbal attacks can leave victims feeling socially isolated, frightened, and over time, even depressed or overly anxious. Constant harassment can have a detrimental effect on children's feelings of self worth, and low self-esteem is commonplace amongst children who have been targeted by bullies. Over time, the effects of bullying can even promote aggression in victims, some resorting to violence as they search for ways to fight back. In films, bullies are often easily recognizable - they tend to be portrayed as big, tough, and clearly angry individuals. In reality, though, bullies come in all shapes and sizes, many of whom are good students and star athletes. Though there are no hard and fast rules, there are some generalisations that often hold true. Boys are more likely than girls to engage in aggressive, physical bullying, using threats or violence to keep victim feeling intimidated. Even when they refrain from hitting their victims, they present a menacing demeanor, making the victims feel that they are in danger. Girls, on the other hand, rarely resort to physical abuse, but their brand of bullying is every bit as damaging. Girls may single out a victim and then purposefully isolate her from others by ignoring her, calling her names, spreading false rumours about her, and even coercing other girls into following suit. Girls who bully often garner the passive cooperation of other girls by threatening to isolate them if they befriend a girl that they've targeted. The social immaturity that is common amongst tweens and teens can mean that other kids not only fail to stand up for victims of bullying, but may also participate in the harassment for fear of being the next one in the victim's shoes. Verbal: Taunting, teasing and name calling all constitute verbal bullying. Psychological: Being purposefully frightening, starting or perpetuating rumours, mindfully excluding someone from conversations or social gatherings, and using stern looks or other means to make a child feel unsafe, although no physical contact has actually been made can make kids anxious and uncomfortable. Physical: Sometimes, bullying progresses to include violence, physical abuse, or aggressive behaviours, putting kids at significant risk of injury at the hands of bullies. Ideally, parents and other adults who are involved in the lives of children will teach them to be sensitive to the feelings of others, minimizing the chances that they will engage in bullying. Talking about compassion, the importance of reaching out to those in need, and valuing others can go a long way toward prevention, especially if kids see their parents actively standing up for what they believe is right. When adults notice that a child or teenager is being singled out and treated badly by an individual or a group of peers, they need to step in and put a stop to the behaviour. 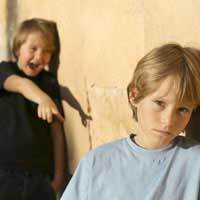 Oftentimes, kids are reluctant to seek help when they are being bullied, for fear that drawing attention to the situation will either make them appear weak or may even increase the abuse if the bully decides to retaliate for any trouble they may get in from authority figures. Therefore, it is up to adults to keep a close watch on children, intervene when necessary, and then follow up by paying special attention to the bullied child to be sure that they remain safe. Bullying is not simply a rite of childhood; it is abuse and it should never be tolerated. Victims often suffer both short and long term effects, sometimes serious enough to cause significant psychological damage. Kids who are being bullied learn to shy away from social situations in order to protect themselves, but by doing so, they may fail to develop healthy relationships with others. When abuse continues for a length of time, victims sometimes turn to violent behaviour, feeling that they have to take dramatic steps in order to be free of the constant harassment. When parents and educators are unable to stop bullying, they may need to seek the help of law enforcement officials, but whatever it takes, bullying behaviour needs to be addressed.